The great Namazu Colonly, one of countless celestial beasts with alien cities seamlessly interwoven into the hulking anatomy. Only seldom seen through the most powerful telescopes pointed at the farthest edges of the galaxy, much of these space gods and their inhabitants remains a mystery. This concept of giant space creature/cities has fascinated me for some time and I would love to further explore the theme and develop fiction around these enigmatic titans. Although, it's definitely not a simple subject to convincingly depict. The first challenge was scale. This piece was created in a 640x640px composition, which may not seem large in itself, but that's a lot of dots to fill for pixel art. 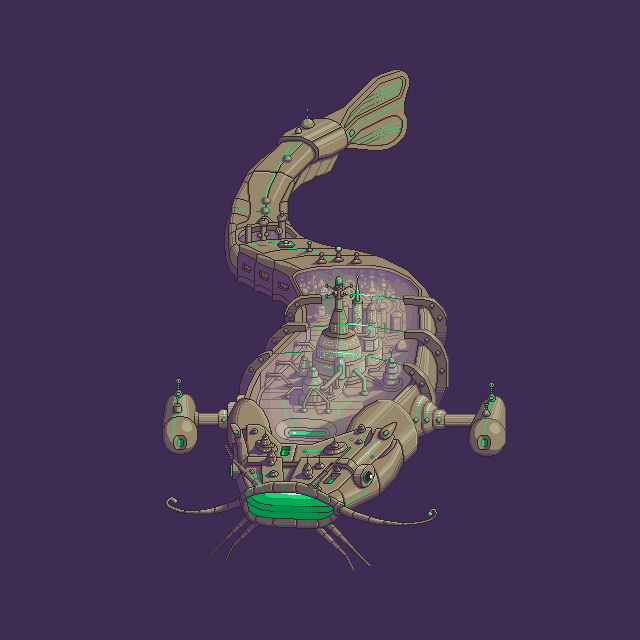 In terms of the fish design, it was very fun but tricky to incorporate a staggering amount of precise mechanical details into an organic shape and still preserve enough recognizable anatomy of something that's characterized for being soft and curvy. 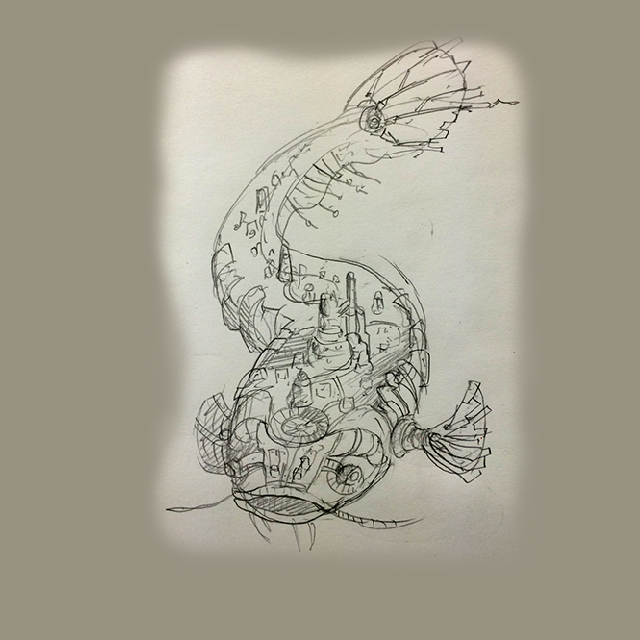 Furthermore, the contorted gesture of the fish causes the perspective of the mechanical details to shift several times across it's body. This not only made it hard to manage the perspective of the forms, but also the lighting effects. Although, it wasn't all tedium to slowly chip away on this over the course of 2 months. 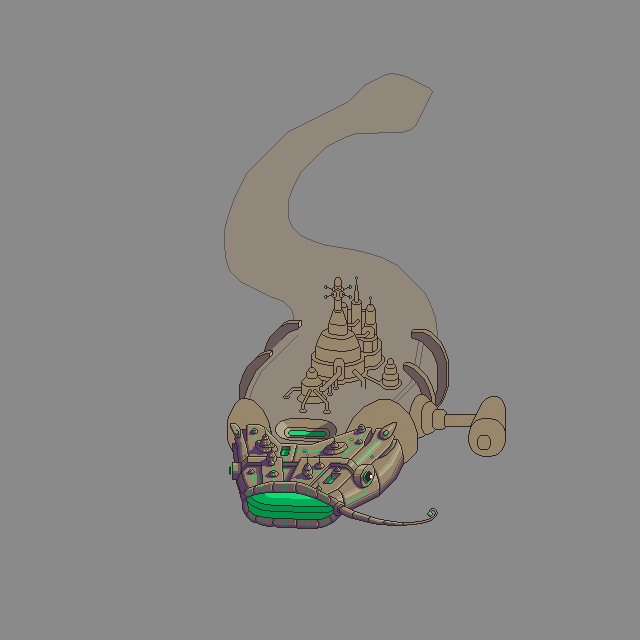 I had a great time designing the mechanical details and pondering the potential stories in this fantastic universe. I always enjoy making color palettes as well, and these synth wave inspired colors do the space theme justice. Throughout the creation process I periodically snapped screen shots to document my work. While the interval between screen shots was somewhat inconsistent these images capture a nice summary of the entire process. You can see I developed the face before I fleshed out the rest of the body. Sometimes I like to test a concept by fully detailing a small portion before spending much time cleaning up the whole. This allows me to quickly establish scale, perspective, colors, and can help me better visualize the complete work better than just a rough line drawing. In spite of the difficulties, I'm quite pleased with the results. By pushing through this challenge I have become a better pixel artist, and am already well into my next large-scale piece!